Hello prim friends!! Be prepared, this post is long and picture heavy so grab a cup of hot chocolate and stay awhile. It is very cold and rainy here in WV today...temp is only 33 brrr. I'm staying in and getting some cleaning done. Just wanted to get on and do a long overdue post and share some pictures. Last month I participated in my very first swap. It was The Prairie Harvest swap that Amy from Bumble Bee Lane was hosting. Amy was my partner. She sent me some wonderful prims. I loved everything! Thanks so much Amy!! I wanted to share my prim goodies that Amy sent. Thanks again Amy it was so much fun getting to know you and starting a great new friendship! I finally finished all my fall decorating. It seemed like it took me forever to get done tweaking things. I like to keep my fall decorations simple. I like to use real gourds and Indian corn. I love bittersweet and I use a lot of it in my displays. Here are pics of some of my fall displays. My hubby finally made time to make some prim creations that I had drew up for him to make. I have to have him cut everything out because I'm afraid to use the saws and I'm sure that I would mess it up anyways. So I draw up the design and he builds it and then I do the painting and antiquing. Here are some pics of out latest creations. Well I'm off to go finish cleaning and start making chicken and dumplings for supper tonight. Wow you've been busy! Love your fall decorating ~ very lovely! I really like all your goodies Amy sent you too. They look great in your displays! Your new projects turned out great too ~ love the lap desk & sampler. Hope you have a great day! Hi Christina, Welcome to blogging! It's so wonderful to be able to share our primitive journeys through blogging and comments, without ever having to leave our homes. You are going to have so much fun!! 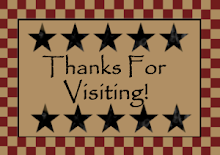 I welcome you to stop by my blog sometime for a visit, when you find a free moment http:Marmmiesmammysandmore.blogspot.com. I am a new follower sent over from Amy! So look forward to getting to know you. I just love this sweet bloggie world and all the wonderful friends. Stop over and visit me sometime. Love all your new treasures. You have a wonderful fall decor. Great swap goodies!The pieces made from your husband are beautiful.